Search the internet for, “How do I train my new puppy,” and you’ll get as many results as the day is long. Use a clicker, use a special collar or leash, don’t use treats, use treats, sign up for group classes, take your puppy to a trainer, pull your puppy on the leash until he learns to walk with it. The list goes on and on and is quite often filled with misinformation. The fact of the matter is training your puppy, or any dog, is all about working with their individual personality and not against it. Every puppy has his or her own learning style or ways and filters they process information by. Some puppies are naturally inclined to be distracted. The world is full of sights, sounds, and smells and many puppies simply can’t wait to explore them all. Others tend to be observational, watching and waiting- thinking things through before acting. 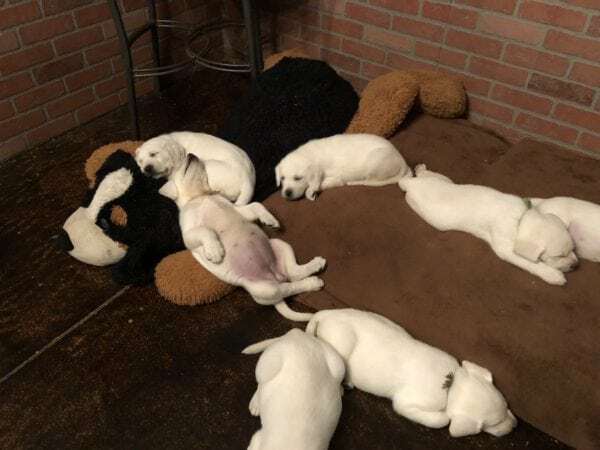 I’ve had the privilege of working with many puppies over the years and I’m always amazed by the variety and combinations of personalities I meet. Some puppies need to be challenged on a regular basis or they become bored and troublesome. One puppy I worked with, a Labrador Retriever named Wanda, is a very athletic girl with a keen sense of smell. Her obedience was was on point and she was wonderful indoors, but she was easily bored which meant she usually found some way of entertaining herself that involved jumping over fences (yes, a 4 month old puppy can jump fences) and chasing squirrels. Knowing this, we were able to use nose work as an incentive/reward and a challenge to keep her mind busy and her body out of trouble! She absolutely LIVED to do any activity that involved her nose. Another puppy that sticks out in my mind is a Bernese Mountain Dog named Gilley. Gill is a very sweet and smart boy who enjoyed repetition and routine much more than challenge. He excelled in what we call ‘puppy yoga’ and to this day does best when his daily routine doesn’t change much. By understanding where Gilley is mentally, his owner is able to help him live in our world much more comfortably and the reward is a content and happy dog who enjoys being at her side or laying on his bed. Knowing your puppy’s personality type is all about setting them, and yourself, up for training success. In fact, let’s not even call it training. It’s more of a lifelong journey made much easier by a mutual understanding of one another. After all, you did make the decision to bring home a puppy because you wanted the special bond of a family pet. Laying the foundation for a good relationship in puppyhood is the key to fulfilling the friendship and partnership you AND your dog desire. What better way to do that than treating your puppy as an individual rather than a robot?